Flexible space and lease terms: A BrandBox store ranges from 500 to 2,500 square feet and leases run six to 12 months. 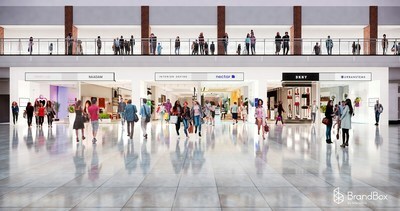 Spaces have modular walls and tracking systems to be easily re-oriented for a new store configuration, and lighting and fixtures are easily swapped out. All the services needed to open: BrandBox offers high-touch support on design and buildout, staffing, and technology through partnerships with industry leaders including Bobby Redd, FITCH, Vitra, RetailNext and Boomtown. Each store comes prefabricated with plug-and-play technology and utility including WiFi, retail analytics (pre-wired to support all major POS systems), security tags and cameras, storage for inventory, and a breakroom. Store designs tailored to each brand: BrandBox works closely with each brand and design partners to help brands quickly and cost-effectively navigate the design process. The result is a storefront where consumers can experience a retail environment that mirrors a brand's ethos. Social and experiential marketing: BrandBox is a three-pronged approach to retail, with a storefront, social marketing, and experiential programming to drive foot traffic and additional brand awareness both offline and online. We've partnered with best-in-class agencies to see creative visions to life for each group of brands at BrandBox. Offline analytics comparable to online: Brands have access to a proprietary retail analytics dashboard to measure in-store sales and customer engagement as they would in the digital world by analyzing data including anonymized foot traffic, conversion, customer flows, and sales. They can measure a lift in local ecommerce traffic resulting from opening a store with BrandBox. Physical retail education: As part of the commitment to be a resource for brands navigating the shift to offline retail, BrandBox offers extensive educational content on BrandBox.com. Winky Lux – Winky Lux is a cosmetics brand that is veering away from the traditional supply chain to offer fashion-driven and beauty obsessed millennials a luxury makeup experience with sustainable, non-toxic ingredients and affordable prices. Naadam – Naadam is a luxury ready-to-wear brand that specializes in rare cashmere that is sourced responsibly and sustainably from nomadic Mongolian herders and delivered to customers at unexpected prices. Interior Define – Interior Define is reconceptualizing the furniture shopping experience. The home furnishing company's made-to-order production and digital-first approach allows consumers to design high-quality, custom pieces at competitive prices. Nectar Sleep – Nectar Sleep is a new online retailer providing the most comfortable memory foam mattress on the market and at the price of your dreams. DKNY – DKNY is a New York-based fashion house specializing in fashion goods for men and women, founded in 1989 by Donna Karan. UrbanStems – UrbanStems is a DC-based online flower delivery company that creates a one-of-a-kind gifting experience nationwide.